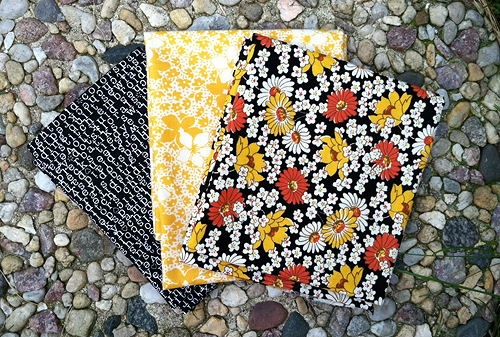 Thank you all for your kind words about my Summer Sampler Series quilt top. If you have followed my blog for any amount of time, you probably know that I live in the Chicago suburbs so that photo with the cows was most likely not from around my home. I am on vacation (brought the sewing machine!) up in Crystal Lake which is in northwestern Michigan. My in-laws have a home here so we visit often. Although it is a long drive with kids (at least 7 hours usually), it is a welcome change from the crowds and hustle of the Chicago area. 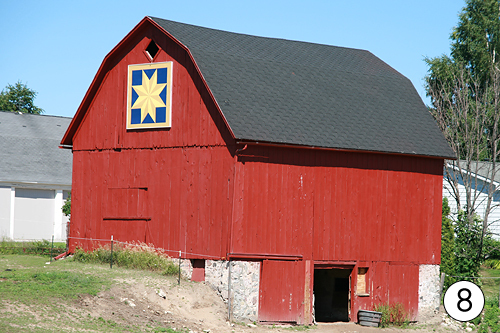 We try to visit different areas of northern Michigan when we come, and that usually includes the Traverse City area. 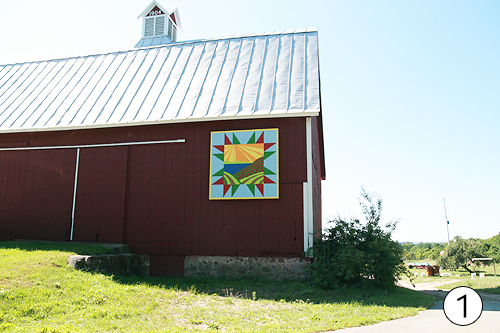 This trip we decided to see all the quilt barns on Mission Peninsula. 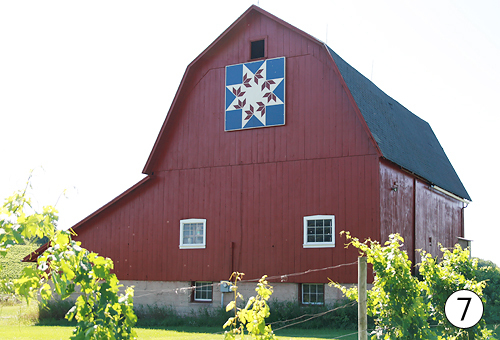 Mission Peninsula is an area just north of Traverse City that is full of hills, barns, vineyards, wineries and beautiful views. I've numbered my photos to correspond with this map that we followed. 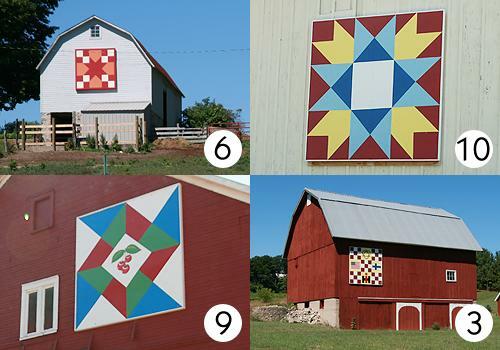 It was like a fun treasure hunt and I discovered my husband is really good at spotting a quilt block on a barn in the rear view mirror. 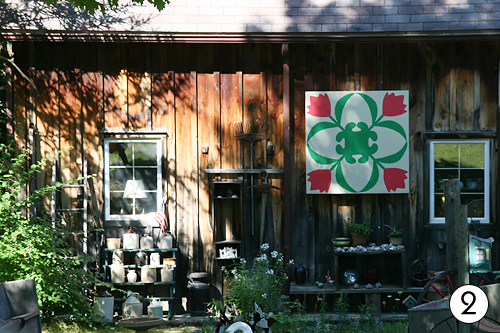 We also took a drive to Sutton's Bay and on the way home we stopped at a local quilt shop in Cedar, Michigan called Liberty Bell Quilts. It was totally adorable, surprisingly modern, and I was able to pick up a few fat quarters. 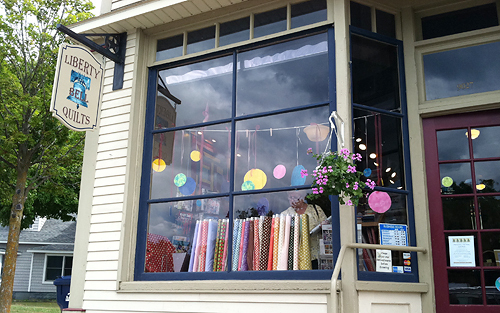 Next door was an amazing looking yarn shop called Wool and Honey. I didn't go in as my husband and the kids were waiting for me in the car, and now I'm kicking myself - even though I can't knit. Their website and blog look so cool! I will definitely be back. We are now heading up for a couple nights at Pictured Rocks National Lakeshore in the upper peninsula of Michigan. I have never been and am really looking forward to seeing it's natural beauty. In the meantime, I will leave you with a photo of one of our little friends here that likes to hang of of the hole in the tree and stare at us on the deck.